From “jive turkeys” to WKRP’s notorious televised Thanksgiving airdrop, turkeys have historically gotten less respect than the late Rodney Dangerfield… or have they? 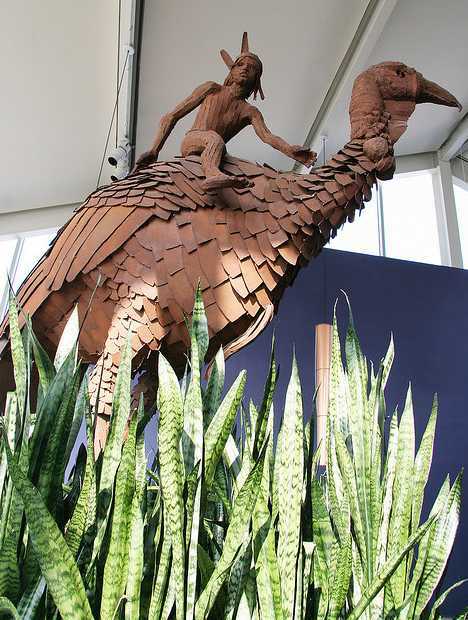 These 12 tall & tasteful turkey statues pay well-deserved tribute to the succulent bird that gave sustenance to the Pilgrims. Turkey for Thanksgiving dinner may be big in the USA but back in Merry Olde England the bodacious bird is more commonly consumed for Christmas dinner. Take a Sunday drive through rural British farmlands in December and you’ll come across countless giant turkeys advertising roasters for sale. 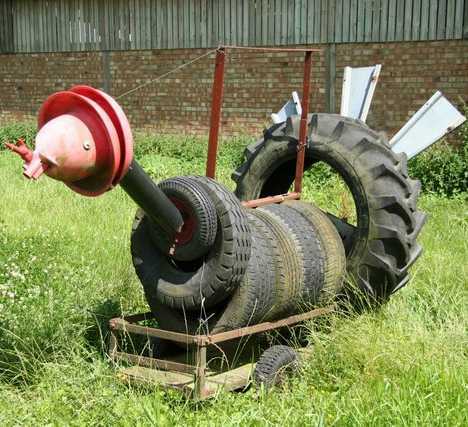 Some look more lifelike than most, others like the “tired old turkey” above sacrifice authenticity for expediency. God bless us everyone! 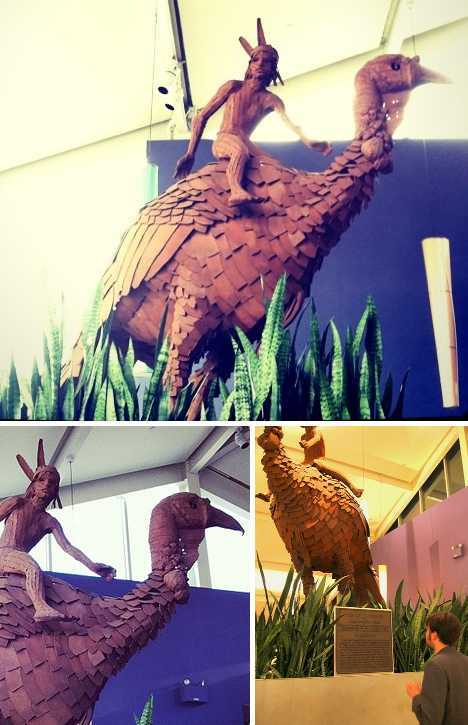 Either that’s a really small boy or a really big turkey, and only artist Christopher Parks knows for sure! 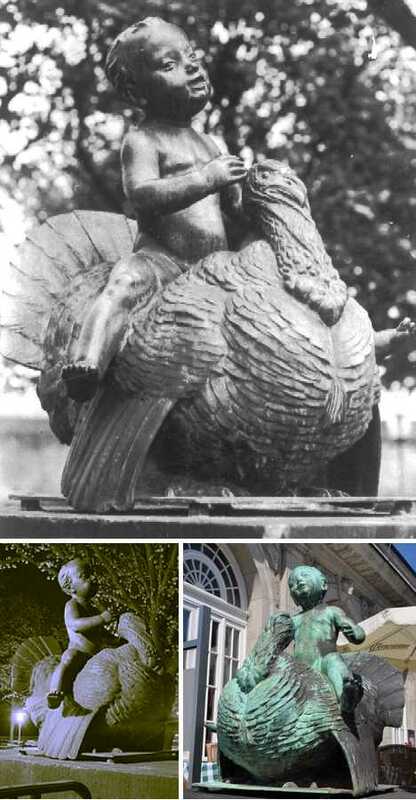 The “Wild Turkey” statue/sculpture was presented to the people of Paramus, New Jersey on March 14th of 1974 in conjunction with the opening of the Paramus Park mall on that date. Originally located on the mall’s main floor, the artwork was eventually moved to the second floor where it resides today. What’s the connection between Paramus and turkeys? We’re glad you asked: it seems that the colonial settlement was named “Parampsepsus” by the local Leni Lenape tribe, which means a fertile land where maize was grown and where wild turkeys were abundant. The more you know! The renaissance artist Giambologna may sound Italian but his birth name was Jean Boulogne and he was born in Douai, Flanders in the year 1529. 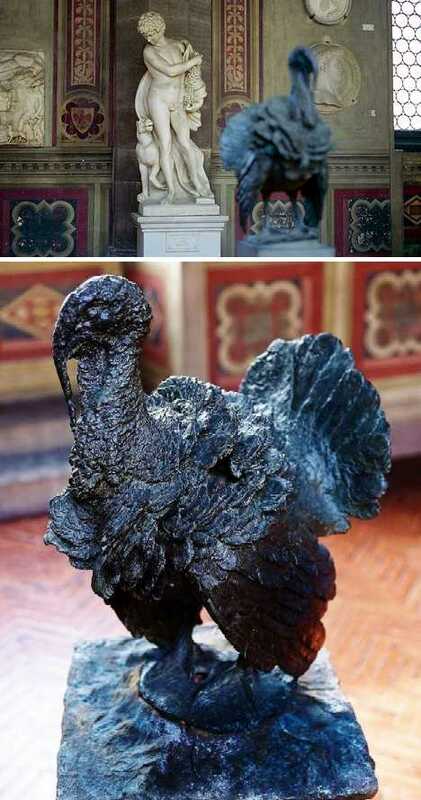 Moving to Florence, Italy in the mid-16th century, Giambolgna soon attracted the notice of the powerful Medici family and in 1567 crafted this astonishingly realistic turkey for the Duke’s gardens. Turkeys had only recently been introduced to Europe, having been brought back from the New World by some of the first explorers. Before August 8th of 1986, Frazee, Minnesota was known for its abundance of turkey farms… that was before “Big Tom” came to town. Standing 16 feet tall and made from white-painted fiberglass, cardboard and insulation attached to a steel frame, Big Tom put Frazee on the map as the home of The World’s Largest Turkey. Oh, the turkmanity! 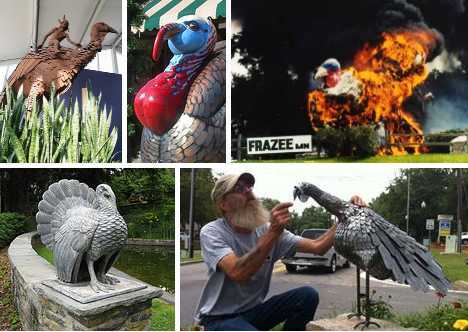 Frazee’s most famous attraction met the fate of most actual turkeys on July 1st, 1998 when a wayward welding spark set the gargantuan gobbler’s flammable stuffing ablaze. 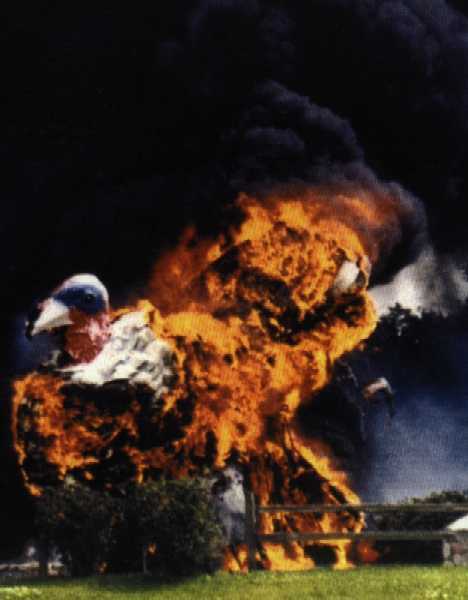 Much like “Touchdown Jesus”, the Texas State Fair’s “Big Tex” and other flame-felled monuments, the original Big Tom’s fiery passing did not cause any human injuries though it probably wounded Frazee’s civic pride a bit. Don’t cry for Frazee, however: the original Big Tom was due to be replaced by an updated, bronze-colored version standing 30 feet tall. 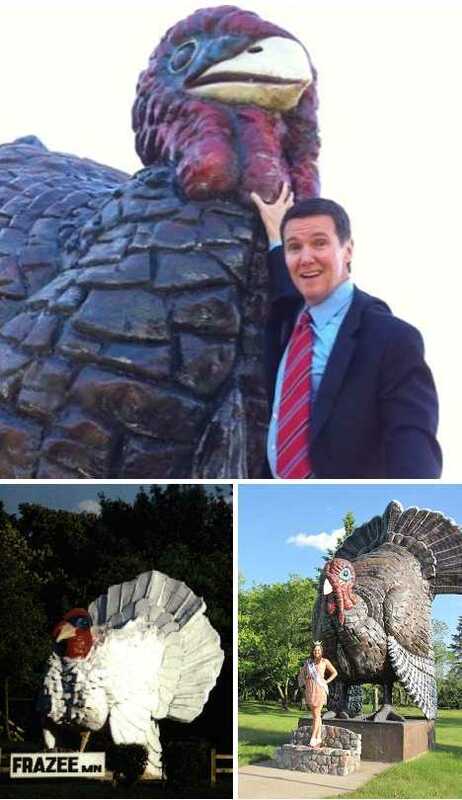 We’re not saying Minnesota’s got a Turkey War brewing but if one should break out, the battle between Frazee’s and Luverne’s giant turkey statues could rival Godzilla vs Megalon. Luverne is tucked into Minnesota’s most southwestern county and, naturally, is a buzzing hub of turkey farming activity. The oversized turkey bidding welcome to patrons of the Blue Mound Inn had better be nailed down good or we’re looking at (removes shades)… A Gobble-lypse Now. YEAHHH!! Grey Towers National Historic Site, in Milford, PA is centered on the French-style Gifford Pinchot House built using local materials and labor in the mid-1880s. Pinchot was the first director of the United States Forest Service (USFS) and was twice elected governor of Pennsylvania. 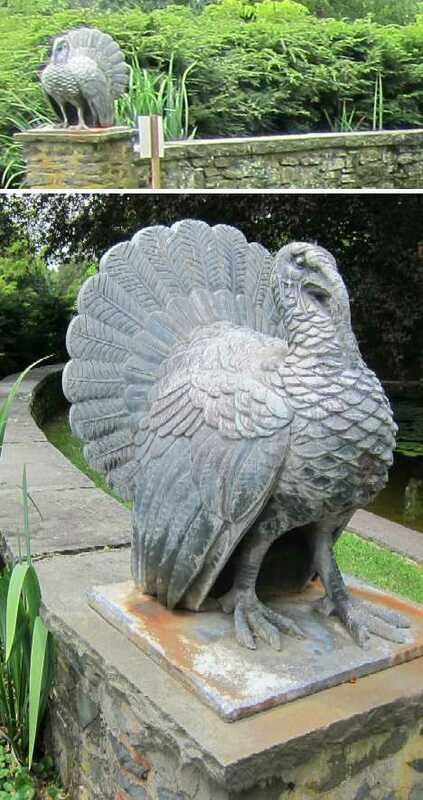 The proud and noble turkey statue above stands guard near the decorative moat on the house’s grounds. What About Bob the Turkey? Sure there’s a ton of turkeys on Facebook but one was a real, live turkey! 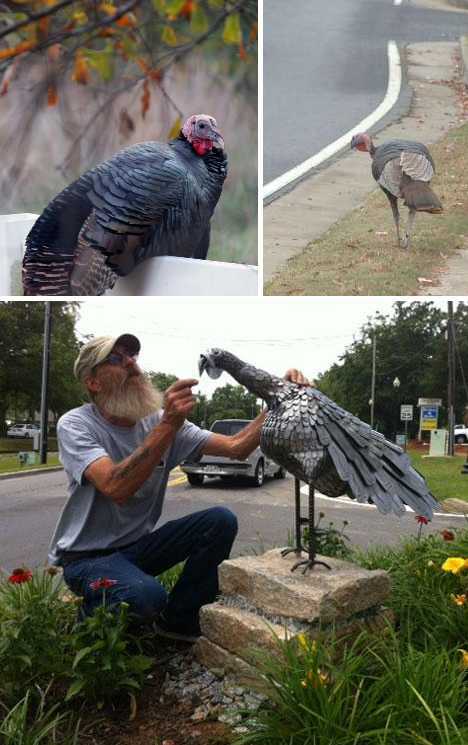 Bob the Turkey from Woodstock, Georgia, still shows nearly 2,000 Facebook likes though he’s sadly passed on to the avian afterlife. What’s up with Bob and how did he earn his very own statue? It seems that Bob, a wild turkey, set up stomping grounds in a disused green space along Woodstock’s Main Street back in the summer of 2011. Pecking at police cars and gobbling at the neighborhood humans, Bob quickly endeared himself to the local Woodstockians. “He’s out here in the middle of the street,” stated resident Mitch Evans, “wreaking havoc on Woodstock traffic.” You can guess what happens next, hmm? On Sunday, January 15th of 2012, Bob met his end at the hands (tires, actually) of an automobile driving down Main Street. He was obviously missed by Woodstocks’ citizens because six months later a metal statue of Bob was placed in a raised green space just outside Woodstock Art and Glass. 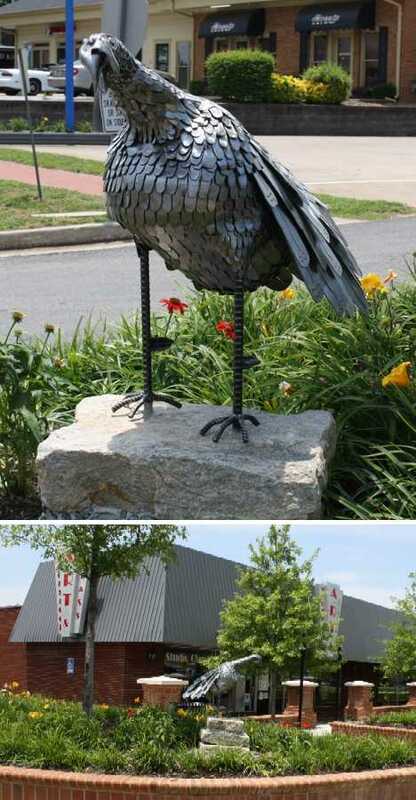 Bruce Weinzetl of Acworth, GA made the 60-pound sculpture out of recyclable materials donated by Cherokee County residents. Probably confuses the heck out of the local pigeons. Bill Haley and His Comets introduced the world to rock & roll music with “Rock Around the Clock” back in 1955. 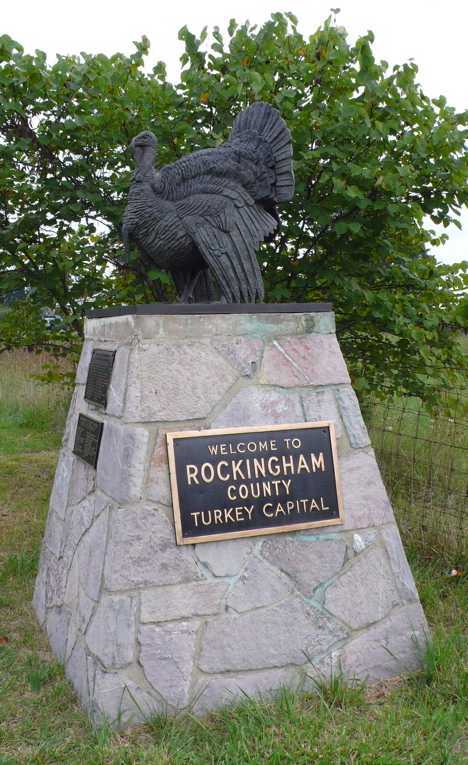 That same year, the Virginia town of Rockingham erected two statuesque bronze & stone monuments to… no, not Bill Haley, to turkeys! Coincidental or not, the pair solemnly stand on the sides of Route 11 on the northern and southern borders of Rockingham County, Virginia’s turkey capitol. At least it was in ’55, when farmers presumably worked around the clock. 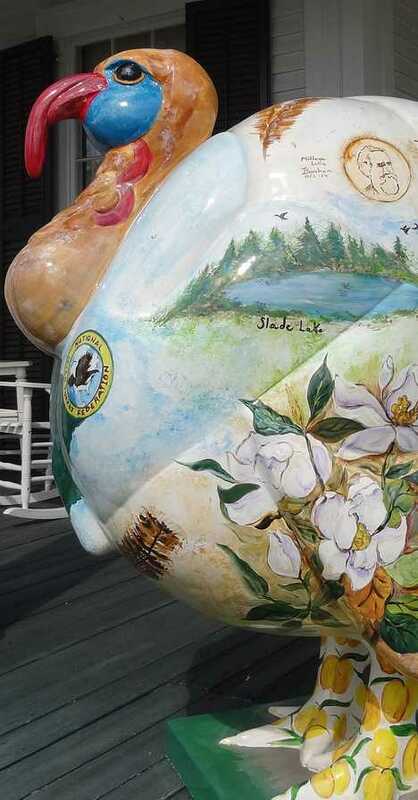 When you’re the National Wild Turkey Federation’s home base, you celebrate the fact and Edgefield, South Carolina has gone whole hog… er, cold turkey? Undoubtedly the many elaborately painted fiberglass turkeys on display in Edgefield get a might chilly on clear winter nights but nobody’s complaining, least of all the turkeys. Edgefield may be small but its been home to ten of South Carolina’s governors including Strom Thurmond, who served from 1947 through 1951. 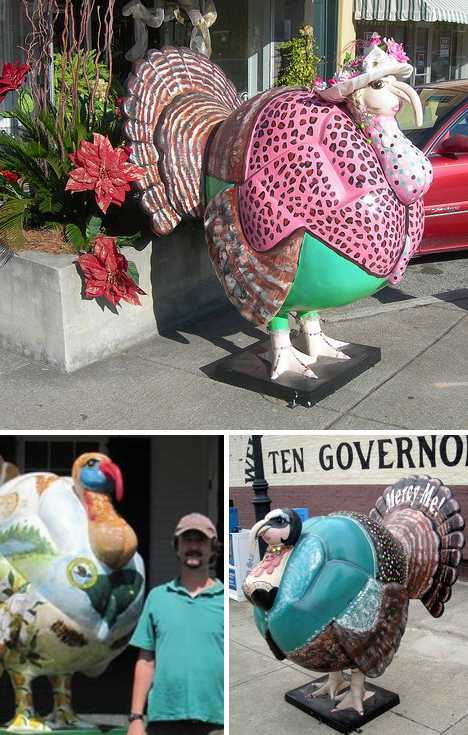 These days, though, turkeys are the town’s real claim to fame and visitors get constant visual reminders of that fact as they mosey through the center of town. It’s enough to stimulate the appetite so stop in for a turkey & pepperjack panini – they serve turkey in Edgefield as well as celebrate them. Pamplona has the running of the bulls, Licques has the running of the turkeys… or as they call it in the local parlance, “Fête de la Dinde”. Maybe it’s not as exciting or dangerous as the traditional Spanish event but hey, when turkeys are your business you work with what you’ve got. Licques’ turkey festival is no latecoming copycat, mind you, the town’s been celebrating all things turkey since the 17th century. Let them eat cake, sure, but in Licques the main course is turkey. Boys riding turkeys? What’s the world coming to? Better (or worse) yet, this odd practice has been immortalized a number of times in bronze and stone. 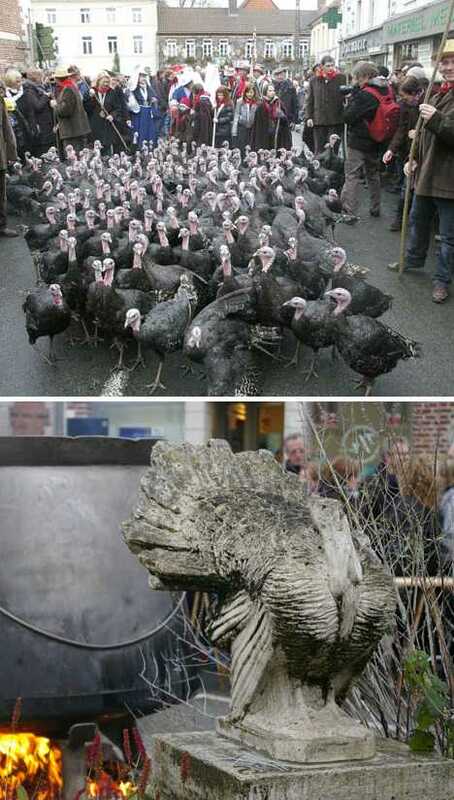 One of these “turkeyboys” can be found on the grounds of the century-old Italienisches Dörfchen restaurant complex in Dresden, Germany. Georg Wrba’s whimsical sculpture has held up pretty well over the past century, all the more remarkable when one considers it’s spent those hundred years in Dresden. Albert H. Hodge (1875-1918) was a prolific Victorian-era sculptor whose work has stood the test of time in London, Cardiff and Glasgow. Hodge’s “Boy and Turkey” dates from 1907 and its companion piece – a boy riding a goat – seems utterly pedestrian by comparison. 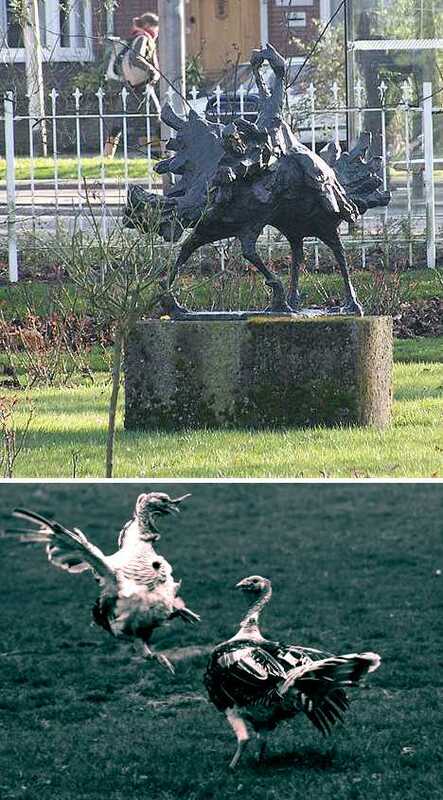 Turkeys aren’t exactly known for their ferocity but Theo Mulder’s 1965 sculpture “Vechtende Kalkoenen” (Fighting Turkeys) purports to state otherwise. The sculpture spent some years at the Kerkstraat in Ouderkerk aan de Amstel in the Netherlands before being moved in 1989 to its current location at the Rosarium in Oudwijk, Utrecht. 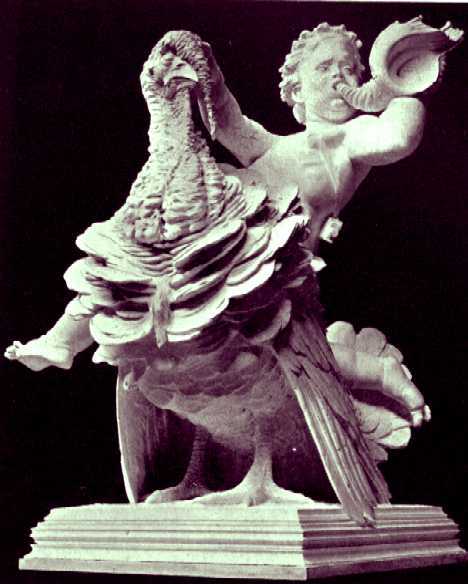 More so than almost any other animal, turkeys were domesticated to provide food for people. From gobbling to being gobbled – rather ignominious, no? Yet around the world we’ve raised monuments and built statues featuring this crispy (if deep fried) critter. Go figure… and while you’re doing that, pass the stuffing!